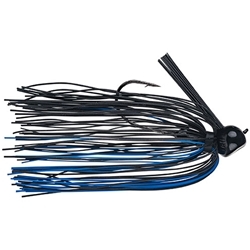 The J-Lee Comeback Jig, designed by 2017 Bassmaster Classic Winner Jordan Lee, features a stand-up football shaped head, a long shank 5/0 black nickel medium wire hook and a long-strand living round rubber skirt which allows maximum bulk and a tantalizing flaring action when dragged along and paused on the bottom. At times this is the edge to trick big bass. Tie one on!